Throw your hands in the a-yer if you’ve been bumping nothing but Outkast since you learned of their reunion for Coachella +39 festival stops this year! Double bonus points if you’ve held onto a copy of Southernplayalisticadillacmusik to mark an epoch in hip hop history, still basking in all its Dirty Southern glory 20 years later. Bewildered a bit to believe that it’s really been 20 years since the best rap duo of all-time and coolest motherfunkers on the planet released their debut album, it feels like only yesterday that tween me saw the video for the title track and fell in love. Andre and Twan would unknowingly go on to teach me so many more things about music, wordplay, extra terrestrial activity, time travel, the Zodiac, a place called Stankonia, GA, love in wartime, hip hop etiquette, all the intangible things that have to do with an individual’s makeup. Over the course of their illustrious and unparalleled career, Outkast would go on to become exactly what hip hop is meant to be, and for that hip hop as a whole will prove to be eternally grateful. Brilliantly balanced by the counterintuitive styles of the pair, Outkast has cemented a legacy unseen by both mainstream success and underground respect. Coming up in the early ’90s, hip hop was drifting toward a divide between East and West Coast, but Outkast was determined to school the world on a sound refined in the South. They taught us all that Atlanta’s Dungeon Family was not only a force to be reckoned with at the time, but that their staying power was significant and worth a listen. They then taught us youngsters what a player was and that they did, in fact, throw a ball. They demonstrated balancing traditional rap with a plethora of personality. They continue to teach that there’s always hope and time for reunions, and because of this week’s announcement of 40 Outkast dates, it’s proof that we live in a world where anything can happen. And in the oftentimes homophobic, misogynistic, materialistic, stereotypical, competitive world of hip hop, Outkast has always been able to remain a cut above the rest by educating, breaking cycles, and setting themselves up to reach the fifth dimension of ascension. Just for fun, we take a trip back to look at all the things Outkast has done for hip hop, for the progression of the artform, for the development of the people…with their music. Picking a favorite Outkast album is like choosing your favorite child, but since Rosie is clearly my favorite child right now, I’ll go out on a limb and claim Aquemini as my favorite output from Outkast. Why? It’s the most complete album to date (reports have hinted at a new record this year), and if I’m ranking all-time hip hop records period, Aquemini cracks the Top 5. It’s got everything, and if you’re cramming for festival dates with Outkast this year, do yourself a favor and focus on this one. Gold. 100% Solid Gold. 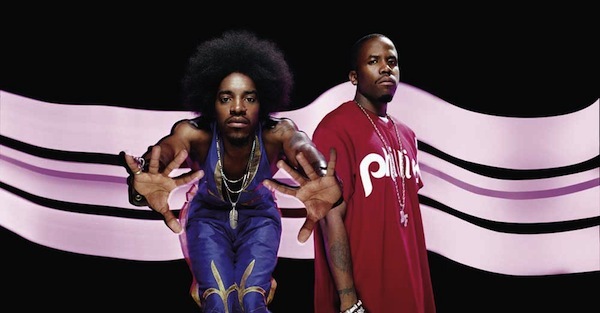 With their 2000 release of Stankonia, an album that would officially introduce them to worldwide success with HUGE singles B.O.B., Ms Jackson, and So Fresh, So Clean, Outkast was ensured as a household name. Celebrating our differences instead of allowing ourselves to succumb to the negativity that usually accompanies them, Stankonia was, in short, politically charged yet fun, serious yet playful, perfectly balanced just like their multi-platinum, Grammy-award winning record. Outkast even does their Greatest Hits different than everybody else, including three new tracks and a couple of remixes to their track listing on Big Boi and Dre Present…Funkin’ Around, The Whole World, and The After Party could all end up with festival-goers this year, and setlists figure to range across the board.